While I don’t believe we pay attention enough to psychology in advertising many advertisers have made good use of the science. Below are common and easy to spot examples. Some of them are intuitive but it still helps to consciously add them to the repertoire. Rhyme-as-reason Effect – Rhyming doesn’t just make things more memorable. It also makes us see them as being more accurate or truthful. The most famous example of this is John Cochrane’s memorable “If it doesn’t fit, you must acquit” defense of O.J. Simpson. Plenty of ad slogans rhyme as well: “A nose in need deserves Puffs Plus indeed”, “Drive sober or get pulled over”, “To save and invest, talk to natwest”. Decoy Effect – The decoy effect is when an extra option is added to a choice that skews someone’s perception of their relative value and sways them in a certain direction. One of the best examples of this is the economist’s print and web sale, which was explored in Dan Ariely’s Predictably Irrational. I pulled this old image off another site, since the economist has now changed their pricing strategy after all the publicity. 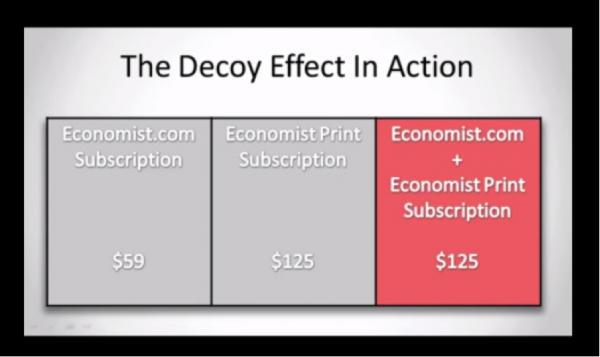 As you can see, the online subscription was offered for $59 and the print option was offered at $125. But, the third option combines the first two. It is designed to pull people from the online option to pay for the print version as well. For the customer this probably feels like a good deal, but many of them probably would have been just as happy with the online subscription only (and they would be $66 bucks richer too). Another example involves restaurants and wine. People will typically buy the second lowest priced wine at a restaurant, which has led restaurants to strategically price their options, typically by raising the price of the cheapest wine so that it becomes the second cheapest thereby increasing their profit margins. It’s worth mentioning, since we’re talking about biases, that a lot of wine’s taste actually comes from perception of quality rather than inherent characteristics, so it actually might not matter to the consumer that the prices are rearranged. Picture Superiority Effect – We are better at remembering images than words. In general this means products are going to be easier to sell than services. Either way, finding an image to say what we need to say is a winning strategy. Framing Effect – You could probably consider the Decoy Effect to be a component of the framing effect. Indeed, almost all of marketing can be attributed to the Framing Effect: How you say something has a big impact on the results of advertisements, even if the information conveyed is the same. Are you more likely to buy a package of beef that says “80% lean meat” or one that says “20% fat”? They convey the same information, but I know which one I’d put money on. Anchoring – The first piece of information we receive about something affects the rest of the information we receive about it. That is, once an anchor is set people don’t tend to move from it as fully as they should. For example, quantity limits can be used to increase sales. If you’ve ever seen a sale that included a maximum limit of the good people could buy that limit actually carries information to us about how many people should buy. It’s creates a starting point for the number we should purchase that is likely far higher than we would have without it. Bandwagon Effect or Herd Instinct – Normally in advertising this is exploited with an appeal to the popularity of the brand. It’s not always bad as surely many category leaders are good products, but it does work off our bias to trust in other people’s opinions when we aren’t sure (herd instinct) or off our attempts to fit in (bandwagon effect). Loss Aversion – We are more averse to losing a particular amount of a good than we are receptive to gaining that same amount. The best example of this deals with blood donations where individuals told to focus on saving lives were significantly less likely to donate than those told to prevent deaths. Functional Fixedness – Functional fixedness is the idea that we are incapable of seeing alternate uses for products once their established purpose is known. The concept plays a role in quite a few riddles. It’s also a common topic for listicles But, it can also be used to boost sales for some products. Imagine Duct tape or Baking Soda starting out. They’re each only used for one purpose each, but as time goes on the companies educate us on additional ones. What do sales do? Skyrocket, of course. Why isn’t humorous advertising more effective? Unfortunately there isn’t much research available on the topic. While the general consensus is that humor doesn’t help much, a few studies have shown that humor is effective for lower engagement products. We can start by stating that humor is overused, then, since it is used in campaigns for more expensive purchases all the time. But, there is a second factor that we should consider, as well. Humor, when it is studied in advertising, is treated homogeneously, but it shouldn’t be because it actually breaks down along two distinct dimensions. Let’s compare two ads to get a feel for the different styles. As you’ll notice, one ad wants us to find humor from somebody using their product, while the other one wants us to find it from someone not using their product. A second difference is the degree to which the humor relates to the benefit the ad tries to convey – does it reinforce the point or is it really there to get attention? From a psychology and branding perspective, using humor that puts your brand or product in a bad light is a bad idea. That’s why the “Jake from State Farm” commercials are an example of the wrong type of humor. Using State Farm’s product creates a negative experience for the customer in the ad – it causes an unpleasant interaction with his wife. That may raise our awareness of State Farm but how could it increase our intention to buy? Many people would view the ad as a success because it has staying power and entered our cultural consciousness in a way that few advertisements do. But the actual barometer is long term sales. 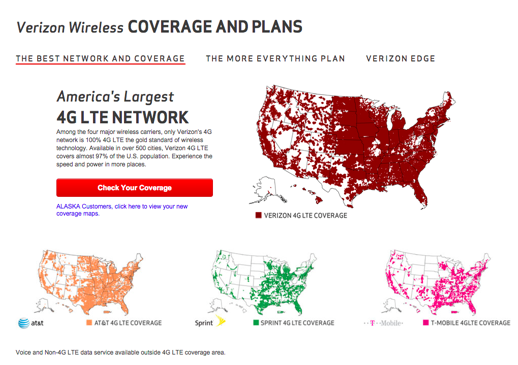 Does the ad make us more likely to use State Farm? I doubt it. On the other hand, the Berlitz ad makes us laugh at people who don’t use their product and the humor also reinforces the product’s benefit. Our awareness of Berlitz rises and we become more likely to use Berlitz because it resolves the situation we are laughing at. It’s a simple but key distinction. In an advertising sense, to be effective humor doesn’t need to improve an opinion of a brand (we think State Farm is funnier now but that doesn’t make us want to use their service) it needs to effectively highlight the brand’s benefits and make us more likely to purchase it. Audi’s ‘Grandpa Bode’ commercial is another good example of a humorous ad for those reasons. Celebrity endorsement aside, it is effective. Moving forward, humor shouldn’t just be inserted into a commercial to raise its memorability. That may get views but it won’t sell product. But ads using positive brand humor, that is focused on the selling point, may prove to be more beneficial. What? 80 million people aren’t exactly the same? Who could have guess that? 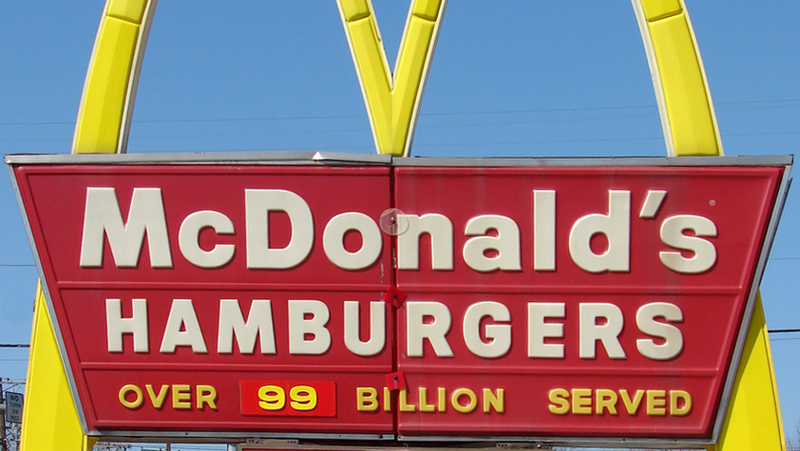 McDonald’s may make breakfast all day to boost sales, but this tactic might be even more effective. There’s probably going to be a part 2 to my analysis of coors advertising but this one will be for bud light. Subway was about to make it worse.